Dr Laura Zita Kéri, deputy director of the Kodály Institute of the Liszt Academy of Music received the Zoltán Kodály Award of the town of Kecskemét this year. The Award was presented by Dr Gábor Zombor, member of parliament, on the occasion of the 650th birthday of the town in the József Katona Theatre on 2 October, 2018. On 14 September the 2018-2019 Academic Year officially began at the Institute, in its temporary home the Old Calvinist College. 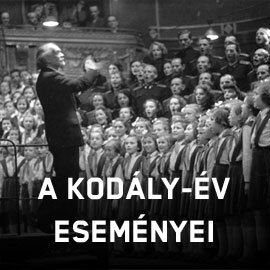 The Kodály Institute of the Liszt Ferenc Academy of Music was given the opportunity to organise the National Youth Choir for the Kodály Memorial Year 2017. The term ‘national’ refers, on the one hand, to the fact that young people from Hungary were joined by Hungarian singers from outside the country, and, on the other hand, to the aim to achieve high artistic quality. Members were selected by the chorus masters Professors Péter Erdei and László Norbert Nemes, based on the recordings the candidates had submitted and on the auditions they took part in. After a week of intensive rehearsals in Kecskemét, the Choir had performances in Keszthely, Vienna, Galanta and Budapest. On 27 July the Choir is coming to a final performance at the Catholic Church in Kecskemét. Our two-week International Kodály Summer School started on 16 July with over 100 participants from nearly 25 different countries. It is with great sadness that I heard of the passing of Dr Mihály Ittzés on Tuesday morning. Dr Mihály Ittzés became co-worker of the Kodály Institute in 1973. He was for a long time director of the library, for 20 years he was Vice Director of the Institute, a leading research professor, a key figure in the musical life of the city of Kecskemét. He lectured, gave seminars and workshops in four continents. Judit Rajk and her students - traditionally - finished the school year with common singing in the Lutheran Church in Kecskemét. The students of the Kodály Institute performed solo vocal works of J.S. Bach, Schütz and Humphrey. On the occasion of the European Year of Cultural Heritage 2018, Europa Nostra and its President Maestro Plácido Domingo invite all citizens in Europe and beyond to contribute to the #Ode2Joy Challenge. Supported by Ambassadors such as the European Union Youth Orchestra (EUYO), the Liszt Ferenc Music Academy in Budapest (Hungary) and the BOZAR Centre for Fine Arts in Brussels (Belgium), this participatory initiative celebrates Europe through our common cultural heritage. It seeks to unlock creativity and encourage participants to make an “#Ode2Europe” as a humanistic and cultural project, based on shared values, history & heritage.